Only recently Toyota Indus Motors launched the next generation of not so successful first gen Toyota Fortuner. The first gen was launched by Toyota Thailand back in 2005. This mid-sized SUV (sports utility vehicle) took a lot of inspiration and parts from Toyota’s other models like the Hilux truck and Toyota Surf, yet another mid-sized SUV. Toyota Indus Motors brought the first gen Fortuner back in 2009. But in 2012-13, Indus Motors started to import SKD (semi knocked down) units and started local assembly of SUV. Toyota Pakistan sold 812 units of Fortuner in the first year of the SUV’s launch and that is the most number of Fortuner SUVs sold in a year by now. The number of sold units dropped by more than half (390 units) in next year, of what it was in the first year of sale. There are a bunch of factors that contributed in low sales of the Fortuner. It can take a whole another blog but some include the vehicle been already old when it was launched, the allegedly under-powered 2.7-liter petrol engine. Considering the fuel prices were sky high only a year ago, potential buyers were not drawn towards this aging SUV. And lastly, there were better, and even cheaper, options available in the form of used (imported) Japanese vehicles including Toyota itself. But that is old story now. The Thailand branch of Toyota Motors Japan launched the new Fortuner in the mid of 2015. The new gen SUV was subsequently brought to Pakistan by Toyota Japan’s Pakistani affiliate, Toyota Indus Motors, in the start of 2017. Let’s take a brief look at the major differences between both vehicles. The new SUV vastly differs in appearance from its previous iteration. Where the first gen Fortuner was very similar visually to other Toyota models in the lineup, the new Fortuner looks like a standalone model. The first gen Fortuner looked like a Hilux Vigo with full cabin. 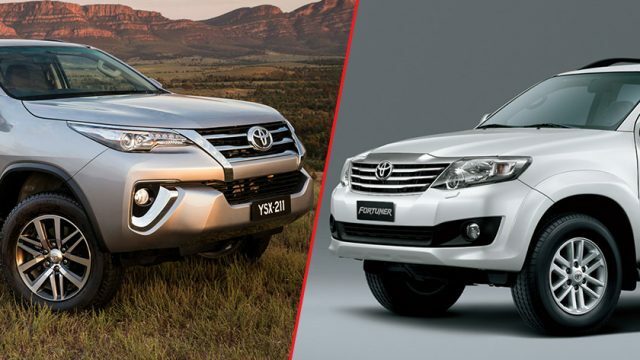 The front end of both the first gen Fortuner and the Hilux Vigo of similar models were similar with minor differences. On the other hand the new Fortuner has a completely redesigned front end that has been raised quite a bit. 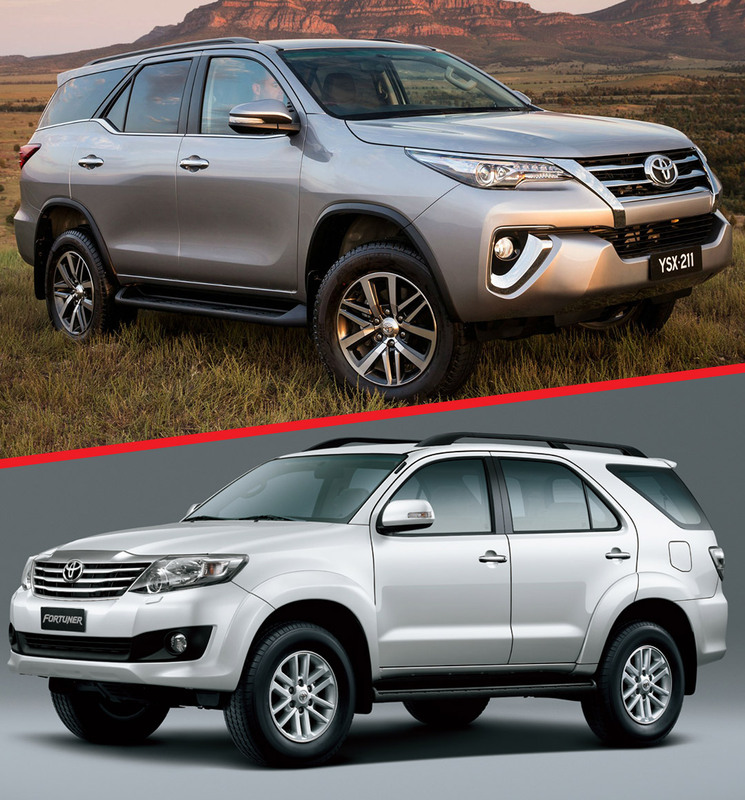 Although the new Fortuner still shares some major components with other Toyota models, like the new Hilux Revo, the appearance and similarities are not that apparent now. Underneath the newly designed body, both the Fortuner and Hilux Revo share the same platform. 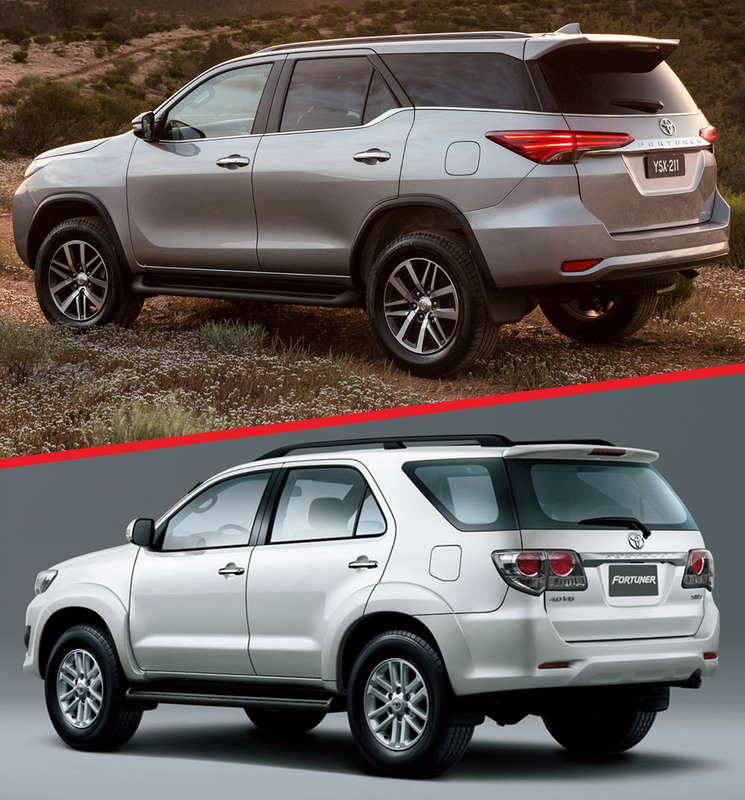 Although the new Fortuner has a high front end, over all Toyota has reduced the height of the new SUV compared to its previous model. New gen Fortuner stands at 1835 mm whereas previous Fortuner was 1850 mm. But this second gen Fortuner is not only longer than the previous gen Fortuner, but also wider. The previous Fortuner was 4705 mm long and 1840 mm wider. The second gen, on the other hand, is 4795 mm in length and 1855 mm wide. As mentioned before, the first gen took most of its inspiration, and parts, from Hilux. But this time around, Toyota actually made an effort and redesigned the interior along with the dashboard of the new Fortuner from the scratch. The new car a nice and sophisticated looking interior compared to previous industrial looking interior. The new vehicle feels premium from the inside, from upholstery to dashboard. Previously it felt purpose built, and had no nonsense kind of a feel to it. The new SUV comes with an 8 inch touch screen infotainment system situated in the middle of a newly designed dashboard. You get leather stitched accents in the middle of the dashboard. The conventional speedometer of the previous gen has been replaced with a better looking new cluster along with 4.2 inch multi display. The seats are all stitched with tangerine coloured leather. There are a bunch of other improvements as well, like the dual zone air conditioning, improved multi control steering wheel, cruise control, cool box, etc. 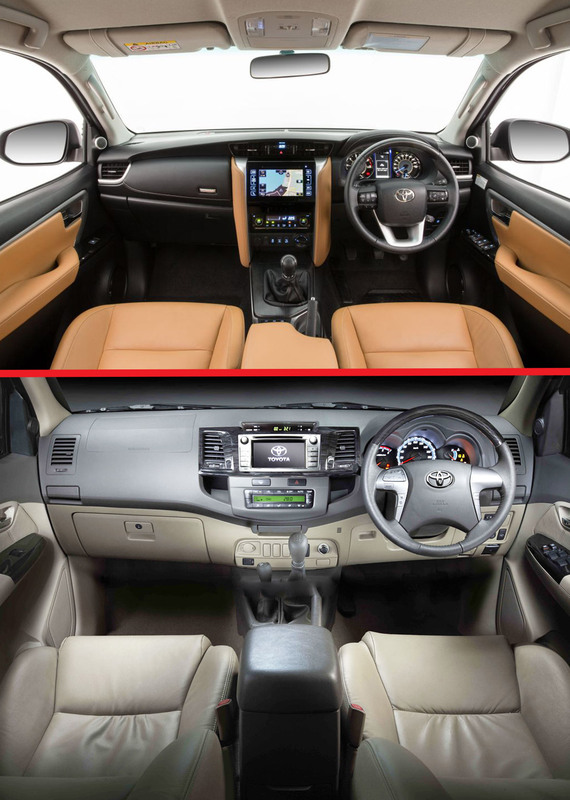 It is quite apparent while looking at the interior of the new Fortuner that Toyota was serious this time. The focus was to bring a premium product that can actually catch the attention of potential buyers. For better or for worse, Toyota Indus has decided to keep the same 2.7-liter four cylinder inline petrol engine that was available in the previous generation Toyota Fortuner. Although the motor is the same 2TR – FE, Toyota has made a few modifications to the updated engine. And the biggest one is the addition of dual VVT-i. The previous iteration of 2TR-FE engine only had VVT-i on the inlet valves whereas this new engine in the new Fortuner features variable valve timing for both inlet and outlet valves. The power has been bumped from 160 bhp to 164 bhp while bring the peak power band from 5,200 RPM to 4,000 RPM. The torque for both pre-2015 motor and the new motor is same, i.e. 181 lbf·ft of torque at 3,800 RPM. The 2nd gen Fortuner now offers a six-speed auto transmission. That is a major jump from the previous 4-speed automatic that was being offered in the first generation Toyota Fortuner. Also, you get paddle shifters in the new gen Fortuner as well. The third change in the drivetrain of the both first and second generation Fortuners is that now you get electric transfer switch in your new SUV to switch between 2WD or 4WD mode depending upon your driving conditions and terrain. Previously it was all manual and you had a physical gear lever in the cabin next to the transmission lever to shift between high and low gears for off-roading. The new electric 4×4 engaging and disengaging system of the Fortuner is yet to prove it toughness in the real world. The previous Fortuner albeit sounds primitive in comparison to the new model, it worked well in real life scenarios and was supposedly less likely to fail. The new 2017 Toyota Fortuner is no doubt packed with features and is a better vehicle compared to its predecessor at least on paper. How it will perform on the roads of Pakistan, that is yet to be seen. But one the most important aspect of the new Fortuner 2017 is its pricing. The new 2017 Fortuner is priced relatively closer to the previous model. The previous Toyota Fortuner was priced around PKR 47 lacs whereas the all-new 2017 Fortuner is priced at PKR 5,249,000.